DETROIT -- While Uber and other ride-sharing services are evaluating self-driving cars, the biggest user of autonomous-vehicle fleets may turn out to be the U.S. Army. The Army, which has hundreds of thousands of vehicles, has been testing convoys of driverless vehicles that follow a truck driven by a human. Initial tests involved as many as 10 vehicles equipped with cameras, radar and onboard computers to identify potential road hazards. The Army wants to learn whether such convoys can ease the workload of its drivers -- a major priority during wartime, when equipment is transported around the clock. 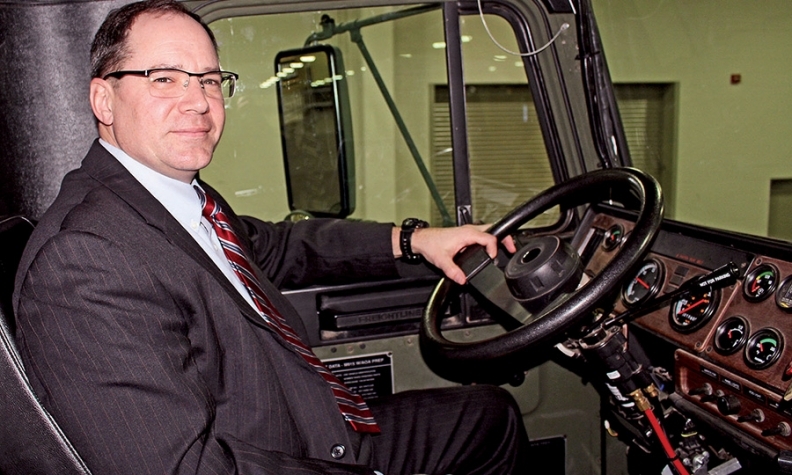 "One vehicle drives and a number of vehicles can follow," said Paul Rogers, director of the Army's Tank Automotive Research, Development and Engineering Center in Warren, Mich. "You won't need as many drivers. You see commercial truck operators trying similar platooning projects at highway speeds." This summer the Army plans to take the next step with a road test of vehicle-to-infrastructure radio links for a truck convoy of at least four vehicles. Each truck will transmit its speed and location to roadside units, which in turn will supply the trucks with data such as lane closures and speed limits. For the road test, a stretch of Interstate 69 in Michigan will have roadside transponders. The transponders, which will cost $5,000 apiece, will have a range of 300 meters, or 328 yards. If the driverless convoys prove to be practical, the Army hopes to retrofit its vehicle fleet with a package of radar, cameras and onboard computers. While the test equipment costs $175,000 per vehicle, mass-produced kits should cost about a tenth as much, Rogers said. That could mean significant business for suppliers such as Delphi Automotive, which produced radar units for the test fleet, and Continental AG, which supplied cameras for the trucks' 360-degree view. The impact of this summer's road test could reverberate beyond the Army. Advocates of self-driving cars are lobbying for creation of "smart" vehicles that communicate their locations to each other and to roadside transponders. Such vehicle-to-vehicle and vehicle-to-infrastructure communications are dubbed dedicated short-range communications, or DSRC. The 2017 Mercedes-Benz E-class and Cadillac CTS sedans will have that capability. But analyst Roger Lanctot of Strategy Analytics argues that federal regulators should have encouraged commercial truckers, emergency vehicles and other fleet operators to use this technology first. "All of these alternatives might have created awareness and demand for the technology," Lanctot wrote in an email. "Most car owners don't understand what DSRC is." The bottom line: Cadillac and Mercedes got a burst of publicity when they announced plans to install vehicle-to-vehicle communications on their cars. But the technology could get a bigger boost this summer when a convoy of olive drab Army trucks rumble down Michigan highways.